Rio Tinto will not acquire any rights to surficial uranium deposits or deposits of other commodities. 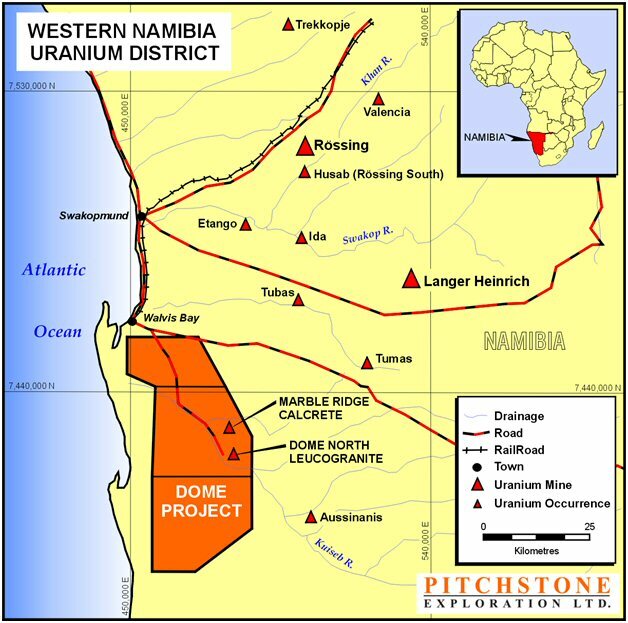 As with all new option and joint venture arrangements in Namibia, the agreement is subject to the approval of the Minister of Mines and Energy.Ted Trueman, Executive Chairman of Pitchstone noted: "Pitchstone is pleased to have Rio Tinto as an exploration partner on the 1,830 square kilometer Dome property. As the majority shareholder in Namibia's largest uranium mine (Rossing), Rio Tinto adds extensive uranium exploration and mining expertise to the project. "Uranium Mineralization at DomeThe Dome property hosts new discoveries of both bedrock uranium mineralization in leucogranite (see news release October 13, 2010) and surficial uranium mineralization in calcrete (see news release March 30, 2011). Uranium in leucogranite is currently mined in the region at Rio Tinto's Rossing mine and uranium in calcrete is currently mined at Langer Heinrich. In reviewing the area around Rossing, Rio Tinto identified multiple high priority targets within the Dome licenses. The locations of uranium mines and the Dome property are illustrated on the attached map and on the company's website (www.pitchstone.net).About Rio TintoRio Tinto is a leading international mining group headquartered in the UK, combining Rio Tinto plc, a London and New York Stock Exchange listed company, and Rio Tinto Limited, which is listed on the Australian Securities Exchange.Rio Tinto's business is finding, mining, and processing mineral resources. Major products are aluminum, copper, diamonds, thermal and metallurgical coal, uranium, gold, industrial minerals (borax, titanium dioxide and salt) and iron ore. Activities span the world and are strongly represented in Australia and North America with significant businesses in Asia, Europe, Africa and South America.About PitchstonePitchstone is exploring for uranium in three proven districts in Canada and Namibia. The property portfolio features 12 projects in the eastern Athabasca Basin, Saskatchewan, four of which are 100% owned. In addition, there is a joint venture on two projects in Namibia and several joint venture projects in the Hornby Bay Basin, Nunavut. Pitchstone benefits from the collaboration of a unique group of geologists with extensive uranium exploration and production experience.To view accompanying map, visit the following link: http://media3.marketwire.com/docs/PXPproperty.jpgOn behalf of the Board,Steven J. Blower, President and CEOThis news release may contain assumptions, estimates, and other forward-looking statements regarding future events. Such forward-looking statements involve inherent risks and uncertainties and are subject to factors, many of which are beyond Pitchstone's control, that may cause actual results or performance to differ materially from those currently anticipated in such statements.Neither TSX Venture Exchange nor its Regulation Services Provider (as that term is defined in the policies of the TSX Venture Exchange) accepts responsibility for the adequacy or accuracy of this release.